If you employ between 20 – 99 employees: you must start the consultation process at least 30 days before making redundancies. Over 100 employees: you need to start the process at least 45 days before dismissals. If you employ 20 staff or more, you must follow a ‘collective consultation’ which is a six-step process. If you employ less than 20 people, then there are no set rules around timescales. However, it’s good practice to consult staff to ensure that you are protecting your business and that you have dismissed staff fairly. During any consultation, it’s essential the business continues to not only communicate with those being made redundant, but also those who will remain. It’s important to make the staff remaining feel valued; if they feel vulnerable, they may be tempted to jump ship – leaving your business in a precarious position. Transparency is crucial, during an unsettling time staff who have not been made redundant need to understand why the process is happening, and what it means for them. There needs to be clear communication on the new structure, for example if staff are taking on new roles as a result you will need to make sure they are happy to do this. Make sure they are not going to be covering a role which has been made redundant, or you could be breaking the law. To boost motivation, it’s a good idea to think about team building and boosting the morale of those remaining. However, be mindful of expenditure – any extravagant purchases by the business following redundancies will not be perceived in a good light. From experience, the best way to manage difficult processes like redundancies is to always be open and honest with all staff – gathering feedback and listening to their concerns. If you don’t consult employees in a redundancy situation, any redundancies you make will almost certainly be unfair and you could be taken to an employment tribunal. 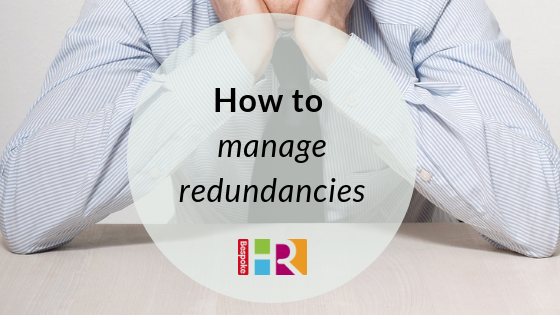 Find out we how we can help you manage the redundancy process.